Stephan Davoust of Durango was carried to the podium after being announced as the men’s individual omnium champion at the USA Cycling Collegiate Mountain Bike National Championships at Snowshoe Mountain, West Virginia. Durango is home to two collegiate mountain biking national champions in 2016. 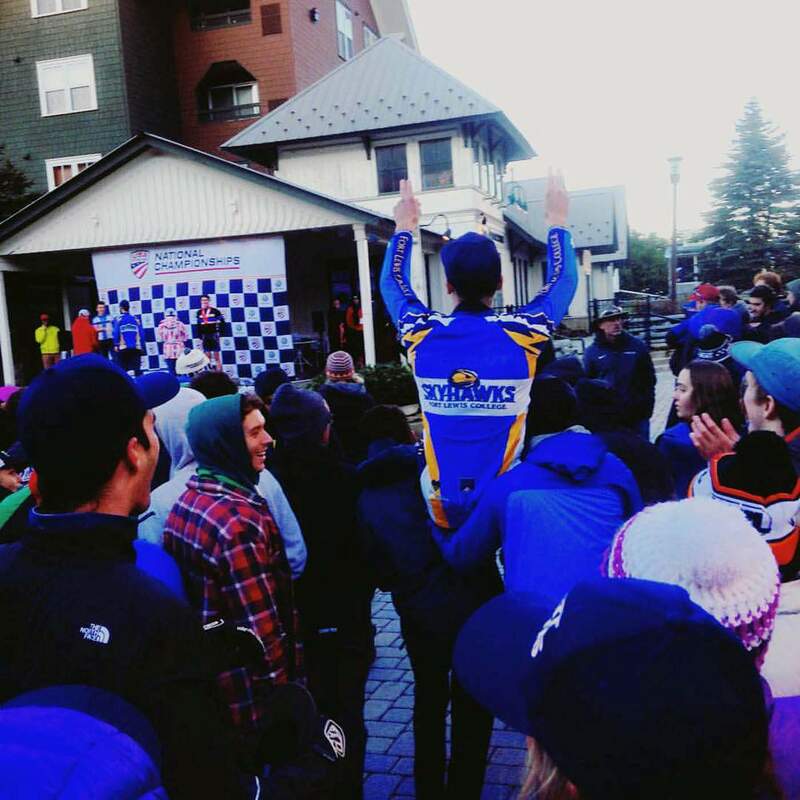 Stephan Davoust of Fort Lewis College claimed the omnium championship Sunday as the best overall rider in Division II at the 2016 USA Cycling Collegiate Mountain Bike National Championships at Snowshoe Mountain, West Virginia. Davoust took second in short-track cross country, fourth in cross country and 11th in dual slalom to earn 330 points without even competing in downhill. Walker Shaw of Brevard College was second overall with 296 points through four events, and Davoust’s FLC teammate Michael Sampson of Holderness, New Hampshire, was third with 263 points after finishing all four events. Emily Schaldach of University of Colorado at Boulder claimed the women’s club omnium title. She finished ahead of teammate Clare Hamilton and Vermont’s Hazel Brewster. The top FLC woman in the omnium standings was Libbey Endersbe, who finished eighth. Sarah Hill of Brevard College won the women’s omnium in Division II. India Waller, a Durangoan who competes for Warren Wilson College, took third. Sunday’s was the last of three days of competition, and FLC got off to a hot start by taking second in the team relay race behind Brevard College. That’s how the final team omnium standings would shake up, too. Brevard finished with 725 team points to claim the Division I national championship, while FLC’s 676 was good for second. Marian University was third with 614 points. CU-Boulder won the Division I club omnium championship ahead of Vermont. Dual slalom was the final event of the weekend, and Collin Hudson of Longmont won the varsity men’s race while representing Colorado Mesa. Davoust was the top FLC man in 11th, Sampson was 14th, and Bryce Hermanussen of Durango was 15th for FLC. Durango’s Derrik Blackmore placed 17th representing Colorado Mesa. Fort Lewis’ Joe Barry placed 19th, an teammate Jaren Lockwood claimed 21st. Durangoan Joe Crosby placed 26th for the Skyhawks. Waller claimed eighth in the women’s varsity dual slalom race. Fort Lewis’ top result came from McCauley Smith, who was ninth. Rebeccah Sheppard of Durango and FLC placed 17th, Libbey Endersbe took 21st for the Skyhawks, and Anna in Schehrer was 24th. Danielle Emter rounder out the FLC results in 30th. Schaldach wrapped up her weekend with a sixth-place finish in dual slalom. She won gold in cross country, silver in short-track cross country and bronze in downhill to bring home a medal of every color along with the omnium championship in her category. Next up for the Skyhawks is cyclo-cross season.